Trump signed an executive order this evening implementing the restrictions. camera (Alba Vigaray/EPA, FILE) People participate in a rally to protest the separation of families under President Donald Trump's travel ban in New York, June 29, 2017. The Trump administration resumed the U.S. refugee program Tuesday after a 120-day ban, but there will be severe new restrictions on admissions going forward. After the four-month review, the administration enhanced vetting for all refugee applicants and determined that an additional 90-day review was needed for 11 countries. However, individuals from those 11 counties will be considered for resettlement in the U.S. on a case-by-case basis, but only if they are determined to be in the "U.S. national interest" and don't pose a security threat, according to the Department of Homeland Security. Applicants from other countries do not need to prove they are in the "national interest" of the U.S.
During the ban, the Departments of State and Homeland Security, in consultation with the Office of the Director of National Intelligence (ODNI), were tasked with determining whether additional security procedures identified during the review process were sufficient to ensure the security and welfare of the United States and whether the program should be reinstated. Those 11 nationalities were deemed to have a higher risk to the U.S. by the interagency review. Those countries are not being identified because of "law enforcement sensitivities," according to a senior DHS official. When asked whether refugee from certain countries could be completely banned after the 90-day review, a senior administration official said he would "not prejudge the outcome" of the review. The new vetting and screening procedures include increased data collection to more thoroughly investigate applicants, better information sharing between agencies to identify threat actors, and new training procedures to strengthen screener ability to detect fraud and deception, according to DHS. Officials acknowledged that processing time may be slower due to the new security procedures that have been put in place. 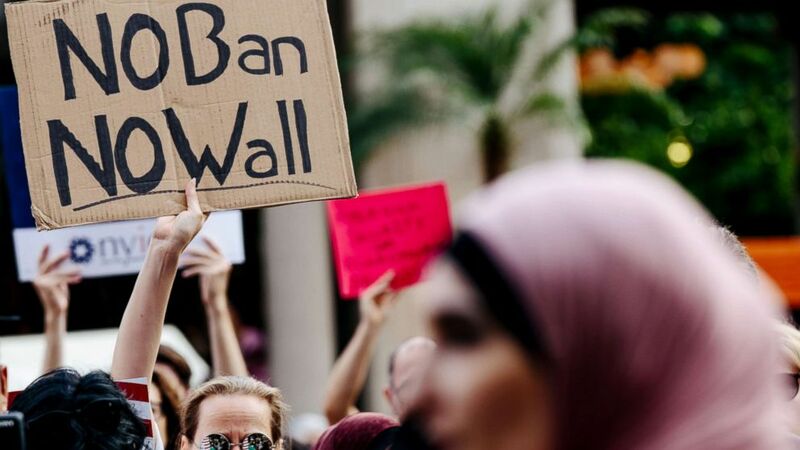 In addition, allowing family members to apply to enter the U.S. through the "following to join" process has been temporarily halted while the government works to increase vetting procedures. The program allows a refugee already admitted to the U.S. to file a petition to request that a spouse or unmarried children under 21 be permitted to come to the U.S. as a refugee. The government is working to implement new procedures to ensure that all individuals admitted as refugees receive similar vetting -- whether they are principal refugees or family members following to join later, according to the DHS. Once the security enhancements are in place, admission of following-to-join refugees can resume, said a DHS official. The president signed an executive order this evening, which replaces the previous executive order that had mandated the 120-day ban and ordered a review of vetting procedures. According to an administration official, the standard for recommending refugees for resettlement is not changing and "vulnerability" remains the bedrock of the refugee program. At the end of January, one week into President Donald Trump's term, he signed an executive order banning all citizens from seven Muslim-majority countries for 90 days, indefinitely banning all Syrian refugees and stopping all refugee admissions for 120 days. That order was challenged in the courts, and in March, the administration voluntarily withdrew its order and replaced it with one that excised the permanent ban on Syrian refugees but kept in place the 120-day suspension of all refugee admissions. After lawsuits delayed implementation, the Supreme Court ruled the 120-day suspension could go into effect in June -- and today it expired. On Sept. 29, the White House announced that Trump had set the refugee admissions ceiling at 45,000 for Fiscal Year 2018, which began on Oct. 1 -- the lowest cap since the refugee admissions program began in 1975. Last year, 84,994 refugees were admitted to into the U.S. Around 22,000 of them were from Syria and Iraq. In 2015, nearly 70,000 refugees were admitted.